';Beloved, I pray that you may prosper in all things and be in health, just as your soul prospers.' 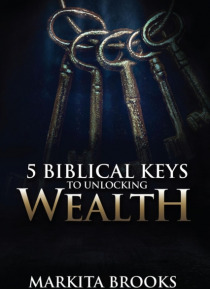 In this book, 5 Biblical Keys to Unlocking Wealth, you will gain access to keys within 3 John 1:2 that lead to your prosperity in 5 vital areas. Author Markita Brooks breaks down the principles of creating wealth from the Biblical perspective and according to God's original purpose and design. As… you read through this book, God will speak to you about your identity, purpose and creative power to propel you toward success in all of your endeavors. The door to success is waiting for you to unlock it, using these 5 Biblical Keys. Start your journey today and connect with the ultimate Investor, Mentor, and BusinessmanGod, your Heavenly Father.